The automotive sector of the modeling industry is fundamentally connected with the business of mutual promotion. In many ways, a talent’s perceived success within the scene through the eyes of fans and other professionals is directly correlated to the prestige of the brands that they have associated with, as well as the pure frequency of appearances they have had under a certain banner, as to suggest an effective chemistry and cohesion between persona and product. Likewise, a brand’s stature and impact upon a particular market is heavily dependent upon the promotional figures they place in positions of direct influence and quite often rely on the developed celebrity of some of these professional brand ambassadors to generate continued exposure and affection for the company. Popular live event extravaganzas like Hot Import Nights Fontana present the staging in which to experience these relationships develop, all through which much of the story of the import scene is told and chronicled. Swagg Wood specializes in intricate wood jewelry design suited to compliment the style and attitude of the individual. Sharing their booth space during HIN Fontana would be ShopHIN, which operates as an online and special events one-stop shop for all official Hot Import Nights merchandising. Jenna Trujillo allures within the scintillating smoothness of seductive elegance, defined by penetrating expressive control and fiery, passionate poise. While her character within visual media awes in mesmerizing emotive inspiration, her manner upon a show floor gives little heed nor attention to the power and effect of her innate talent. She’s just Jenna from the block, that sincere, refreshingly insightful pal that one tends to gravitate to at any stage of a party for some real talk with a side of comedy. It’s this approachability factor and willingness to engage individuals at an even level, which makes Jenna a valuable asset during live promotional tours and campaigns. Extreme Autofest is a popular automotive lifestyle showcase circuit, which has been steadily expanding its influence throughout the Southern California region in recent years. The organization prides itself at creating uniquely themed car culture events, which provide for an atmosphere illuminated in stunning visual fantasy and stylized custom innovation. 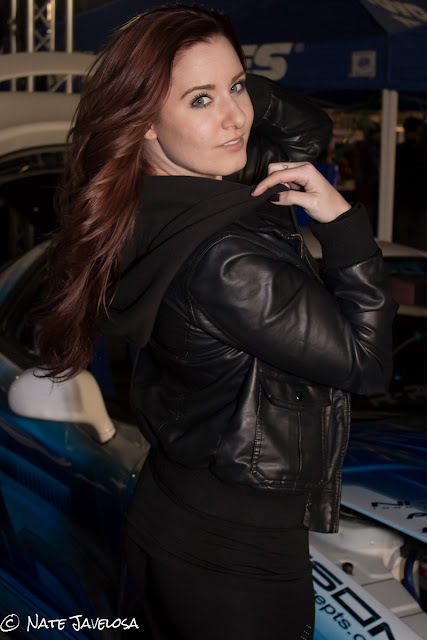 The captivating Ashley Clark would make her 2013 season debut at the Auto Club Speedway, announcing her involvement with the Extreme Autofest event series as an official representative for the brand throughout the course of the HIN Fontana event spectacular. Surrounded by fast stylized vehicles and sporting some hot-rod leather herself, Ashley contributed to that flare and attitude for action and performance, which her booth setup effectively alluded to. However, it wasn’t long until the emotive sugar-rush presented itself in the form of one of the most brilliantly enamoring smiles within the industry today, a natural facet which has become very much Ashley’s own trademark. The sheer expressive quality and clarity she conveys within genuine charm and enthusiasm makes her presence all the more cherished and relevant to the general vibe and character of a live event environment. Toyo Tires is dedicated to the development of high quality tire products formulated upon extensive research and constant innovation for the benefit of optimum vehicular performance within any situation, activity or terrain. Tantalizing in charming expressive tranquility, Joselyn Cano utterly enchants though haunting, immersive passion, characterized by the scintillating subtleties of soothing elegance inherent within her nature. Not many others can influence the mood of a moment with the same level and potency of visual romanticism that Joselyn effectively contributes upon first sight. JDM Sport caters to the passions and preferences of the automotive lifestyle enthusiast through a varied selection of quality automotive parts and accessories, which satisfy through both visual character and performance. Charmingly brilliant through vivacious warmth and sizzling sensual intuition, Jasmyn Skye is a talent who possesses an innate understanding of meaningful emotive projection. She just has this effortless ability of conveying deep, dramatic expression while subsequently inspiring through unbound charisma and energy, which altogether exemplifies the depth and dimension of her talent as passionate entertainer. Limitless Society was founded upon a movement to establish cohesion between the creativity and passion for the automotive lifestyle through dedicated promotion of the ingenuity and personality, which fundamentally compose the scene. Ellie Roxx absolutely charms through adorable sensual serenity. She just possesses a certain flow and grace within her expressive character that is stylistically pristine and emotively intriguing. Such visual elegance is often accentuated by a unique youthful spark within her persona, which ever so subtly sneaks into a situation and is able to affect such warmth and embracing vivacity into an atmosphere or experience. Such dimension and spirit can only afford her more professional opportunities in the future. Copyright 2013 Nate Javelosa. Powered by Blogger.